Medeco® locks are made with pride in the U.S.A. For more than 30 years, Medeco has led the security industry in innovation and quality, guarding lives and assets at facilities worldwide. Only authorized Medeco Security Center in East Tennessee. 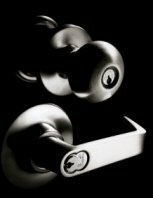 Read about why MEDECO is your best choice for high end security products. Medeco locks protect U.S. government and military installations, both here and abroad, as well as schools and universities, hospitals and banks, vending machines and parking meters, homes and offices, and much, much more. Click Here: MEDECO Presents, "Interactive Security Solutions"
Residential 6-Pin DeadboltSecurity and convenience commonly work against each other. Systems that offer the best security are inconvenient to change, while most flexible systems are easily changed but fall short on true security. Now there’s a way to achieve both security and convenience, without compromise. The new Medeco 7 Series combines high security with a flexible and convenient removable core system. With its tough, water resistant construction, the G8R Series is the padlock to choose for extreme environments like trailers, cargo containers, and gates. The padlock body is constructed of solid stainless steel. You can choose either a stainless steel shackle for maximum corrosion resistance, or hardened steel to withstand severe physical attack. Each padlock includes a weather-seal cap attached by a steel cable. An optional finish plate is also included for applications that do not require a water resistant seal.